As a business owner, equipment enables you to produce products quicker and more efficiently. However, dependency upon this equipment can have negative outcomes if and when a breakdown occurs. Therefore, ensuring that you have identified a viable solution in the event of a breakdown is important. Equipment breakdown insurance provides you with a solution that can protect against the many short and long-term consequences associated with a breakdown. Without this insurance, the setback could be potentially disastrous. As a business owner, you want to ensure that your operations move smoothly and that you are able to provide your customers with products. Equipment breakdown can mean your customers are left waiting. Read on to see if this insurance is right for your business. 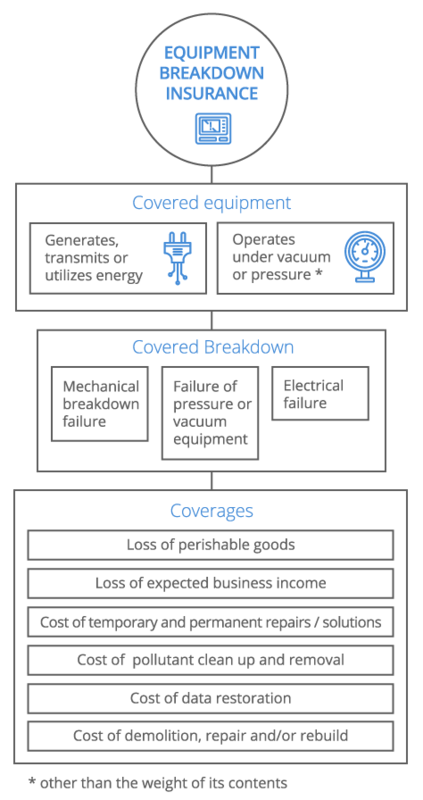 Most property insurance policies exclude losses resulting from the malfunction of equipment unless "breakdown" is the result of a covered peril. Damages due to the explosion of steam boilers owned, leased or operated by the insured are excluded. To address this gap in coverage, the Equipment Breakdown Insurance policy was developed. Equipment breakdown insurance addresses damage to covered equipment owned by the insured. Equipment in the insured's care, custody and control are covered if the insured is legally liable for the loss or damage. Do I Need Equipment Breakdown Insurance? If you own a business which uses equipment to produce products, chances are that your regular policy will not cover all issues related to breakdowns. Considering that the costs associated with equipment breakdown can be disastrous not only in the short-term but also the long-term, investing in coverage for your equipment is an important business decision to investigate. Your equipment may need to be either repaired or replaced, each of which will cost money. You may need to rent equipment so that you can get your operations up and running again. Regardless of the circumstances, there is the strong likelihood that you will not be able to provide customers with products during this time. Your inability to provide customers with products can have both financial consequences and damages to your reputation. If customers need products now, they may need to find them elsewhere. You want to ensure that your operation is moving again as quickly and effectively as possible to mediate these unwanted outcomes. An equipment breakdown also has the potential to cause bodily harm to operators. Additional insurance can cover medical and surgical treatment for operators and ensure you are protected against financial risk. Equipment Breakdown Insurances can provide your business with insurance that extends beyond basic protection for operations, providing you with protection against the many issues that can occur in relation to equipment breakdown. As a result, your equipment is protected for both now and the future against unwanted outcomes. Equipment Breakdown Coverage Protection for equipment that breaks down and must be repaired or replaced. If your equipment breaks down, you will be insured to have it repaired or replaced. Rental Coverage Protection for equipment that must be rented while other equipment is being repaired or replaced. If your equipment breaks down, the costs associated with renting equipment will be covered. Personal Injury Coverage Protection against injury to your person including defamation, invasion of privacy and bodily injury. If you are hurt, you are covered for the costs associated with your medical and surgical treatment. Employers’ Liability Coverage Protection against bodily injury to employees. If your employee hurts themselves in the workplace, you are covered for the costs associated with their medical and surgical treatment. Air Conditioning & Refrigeration Coverage Protection against breakdowns related to air condition and refrigeration. If your air conditioning and/or refrigeration equipment breaks down, you will be insured. Boiler & Pressure Coverage Protection against breakdowns related to boiler and pressure equipment. If your boiler and/or pressure equipment breaks down, you will be insured. Production Systems Coverage Protection against breakdowns related to production systems equipment. If your production systems equipment breaks down, you will be insured. Renewable Energy Coverage Protection against breakdowns related to renewable energy equipment. If your renewable energy equipment breaks down, you will be insured. What Does Equipment Breakdown Insurance Not Cover? If your policy covers an amount less than the total value of the financial losses associated with equipment breakdown, the remaining amount will not be covered. What Are the “Limits” on an Equipment Breakdown Insurance Policy? An equipment breakdown policy covers specific types of protections in addition to what your primary insurance policies covers. Each of these protections will have coverage upwards of a given amount. If your policy provides coverage upwards of $1 million, then this will be the limit. 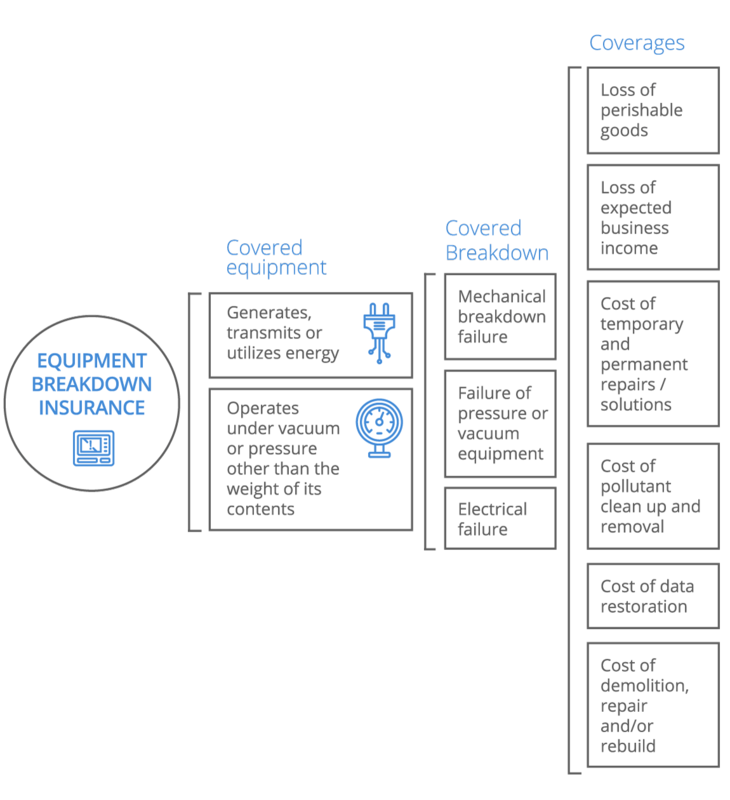 As the types of coverage needed for equipment breakdown vary greatly, each will have a different amount. If you choose a policy that does not cover the full value, then you will be protected upwards of a given amount. The costs associated with equipment breakdown insurance vary in accordance with the specific policy you have chosen. Each policy is created based on your specific needs. Your needs will differ based on the type and value of the equipment you have. You may want to protect different types of equipment, each of which has their own unique risks. Additionally, this insurance can often act as an add-on to your existing basic coverage. Therefore, the costs will differ based on the primary policy you have in place. Overall, the cost will be contingent upon the type of the insurance policy you choose and how much protection it affords. You may choose a policy that includes one, several or all of the aforementioned protections, each of which have their own costs. For example, you may invest in a policy that only covers the costs of repairs and replacements. Someone else may include these protections while adding on protection for operators in the event of injury. Regardless of the protections, you invest in; you will likely find yourself paying a small percentage of that amount in the form of a premium. Therefore, the cost of an equipment breakdown insurance policy can vary depending on what you are covering and to what extent. This insurance covers a business should they need to recall one of their products. Product Recall Insurance will cover the cost of getting a defective product back under the control of the manufacturer or merchandiser that would be held responsible for bodily injury or property damage due to the existence of the product.